Harvest season is upon us, and it’s time to start preparing for the trim. Getting the right tools for the job can make the long hours of trimming pleasurable, instead of mind-numbing. Professional bud trimmers have very strong opinions about favorite brands, styles, and trim techniques. But if you are just getting started, it's hard to sort out a good pair of scissors from a bad one. How do you weed through their opinions to find out what bud scissors will work for you? 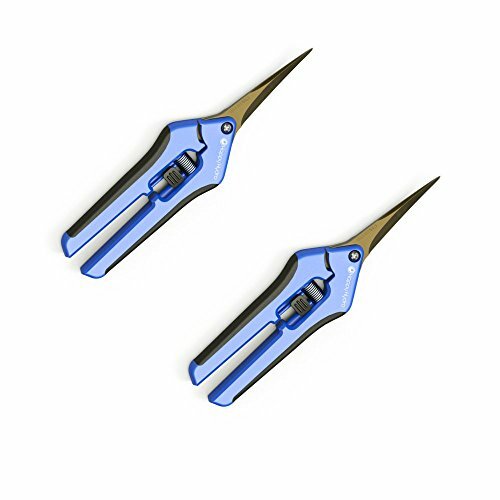 What Makes a Good Pair of Weed Trimming Scissors? 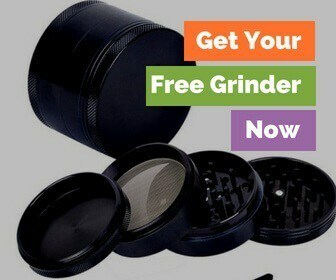 The same pair of bud trimmers isn’t going to work for everyone. Just like the same pair of shoes doesn’t fit everyone, and neither will the same pair of scissors. You'll want to find scissors which fit nicely in your hand and don't pinch your fingers. You’ll also want scissors which open quickly, and easily, without much effort. If you are working to open and close them, imagine how you’ll feel hours into a trim, with resin gunking up the gears. Speaking of which, scissors with more move parts, are going to get clogged much faster than a simpler set. And last but not least, you’ll want a pair of scissors which aren’t susceptible to rust and corrosion. You might also consider that you'll need some tools to break down an adult marijuana plant. A tiny set of bonsai scissors, perfectly suited to careful hand manicuring, aren’t going to do you any good for the breakdown of the crude cola. While it's totally feasible to grab a pair of kitchen shears and chop up an adult plant into smokable pieces, few will appreciate the rough handiwork. 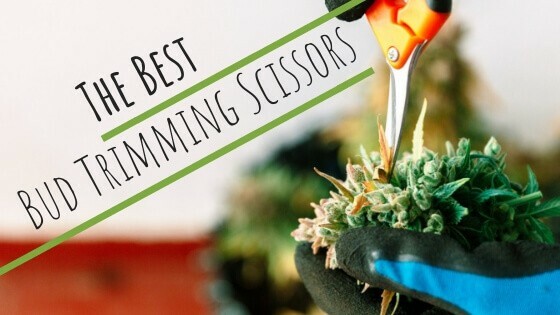 As you prepare for a session of trimming, do yourself a favor and invest in a few different sets of different bud trimmers. Large pruners for the thick, woody stalks, and small clippers for the finer detailed work. What Other Tools Do You Need to Trim? You need more than one pair of scissors, but you’ll also need a few more tools to improve your trim work. First, have a robust set of shears for the big break down, from the adult plant to more manageable sizes of buds. Second, invest in at least one pair of more refined trimmers, for the manicuring process. You’ll want to have a bottle of rubbing alcohol, and a whole roll of paper towel readily available for the cleaning. Eventually, as you collect more and more valuable tools for trimming, you’ll want to get a trim tray. Designed to organize and store all aspects of your trim collection, you'll never misplace that pair of scissors again, everything is in its place. No matter what type of scissors you purchase, they will at some point in the trimming process, require cleaning. Trimming, is by very its very nature, very sticky work. Resin from the cannabis slowly builds up and makes it harder and harder to use. The issue is quickly resolved by wiping down the blades, springs, and moving parts of your trim scissors with rubbing alcohol and a piece of paper towel. Repeat frequently to avoid hand strain and frustration. If rubbing alcohol isn’t for you, Hawaiian trimmers use citrus fruits (lemons and oranges) to wipe their trim scissors down. As you clean your scissors, you’ll note that much of the valuable resin glands are wasted when you wipe it off. So before you use a cleaning product, or rubbing alcohol, collect the sticky build up and enjoy a quick puff. Use a razor blade, or scalpel, and scape each side your scissors blades. Collect the adhesive build-up, while wearing gloves and roll the collection into a little ball. You can save the sticky green hash for later, or better yet, light up a bowl for immediate use. It’s a simple way to sample the flavor of your crop while still processing it. Plus, a quick bowl will also make the trimming experience that much more pleasant. Commercial growers can’t keep up with demand. The labor required to trim a harvest eats up a considerable percentage of their profits. More and more, large-scale grow operations are investing in automatic trimming scissors, and trimming machines. These electric devices, speed up processing time and reduce labor costs. But often, the product suffers. The days of well-manicured hand trimmed buds are in decline, at least for the big players in the industry. Thankfully, small growers and those just growing for their own needs continue to hand trim to maintain the integrity of the final product. Everyone will have their preference, but you'll want to invest in at least two pairs, maybe three. One pair for the big hard stalks, and one for the manicure. For the finer manicure sessions, where you want to take your time to craft beautiful, artisanal buds, you’ll want bonsai trimmers. Designed for the tiny trimming work required for bonsai gardening, this style of scissor is often preferred among professional trimmers for the detailed finishing work. They have no moving hinges, springs or gears, making them less likely to break down from resin buildup. Plus, they come in a pack of five. Helpful, if you tend to misplace your bud trimming scissors after a smoke break. Or, if you want to have a few extra handy for those forgetful co-workers. With five per pack, you’ll spend less time cleaning resin off, by just switching to a new set. Blades are removable, so when needed, you can quickly pop them out to sharpen or replace. If the bane of your trimming experience is the constant need to clean off the build-up of sticky resin, then these scissors are a good investment. Because they come pre-coated with a protective fluorine coating. It's a coating naturally resistant to collecting the sticky crystals from the buds. You will still need to clean the blades, every so often, but the process is must less labor intensive than non-coated scissors. These Chikamasa Stainless Steel scissors are also another good set for the more detailed work. They have long, pointy tips, ideally suited for digging in between the large nugs and digging out the small sugar leaves from their base. The fine tips make your job much more detailed than if you were working with a pair of old blunt kitchen scissors. 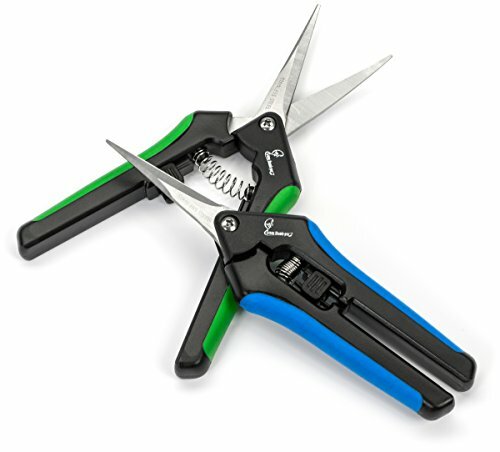 For those who have been working in the trimming industry for years, you’ll appreciate a set of scissors which reduces repetitive strain injury. These shears have a spring based mechanism which automatically opens the blades after each cut. Less work for your fingers, and ultimately they’ll make for speedier trimming. 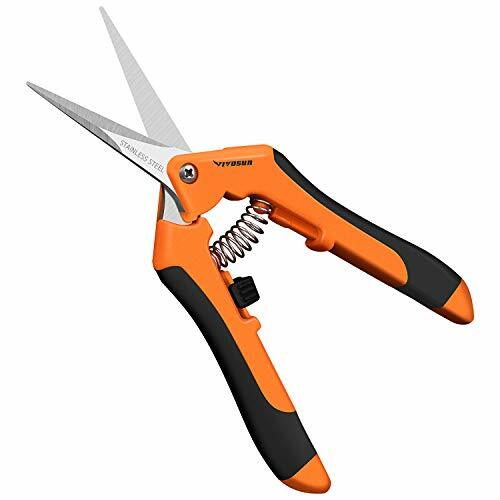 Although fine tipped, these pruner shears are robust and have a lot of downward force, because of the spring loaded mechanism. They make quick work of breaking down the stiff stems and large fan leaves, but point enough to target the sugar leaves. The handles are comfortable, and large enough for even the biggest fingers. 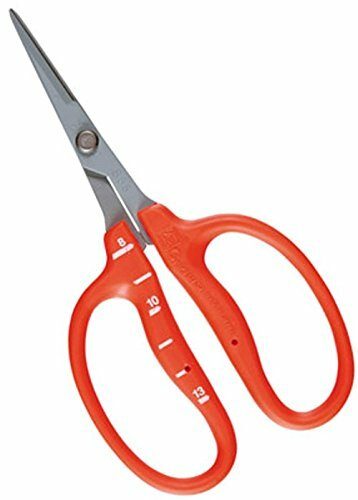 If you struggle to wrap your fingers around the small bonsai scissors, you’ll want to move up to a larger pair like these Vivosun Shears. Trim faster, and more accurately with this two-for-one set of hand trimmers. One set of scissors with long, finely pointed ends, which work perfectly for removing fan and sugar leaves without damaging the delicate bud. Another set, with a curved blade, which wraps around the rounded sides of the bud to craft that beautiful shape for a dispensary-worthy nug. This set of fine trimming scissors are lightweight, and ergonomically designed to avoid repetitive strain injuries, which are so prevalent throughout the trim room. So long as you maintain the spring mechanism, these bud trimmers will hold up all season long, if not longer. Pound by pound, the quality blades hold up and most importantly speed up the trim process, giving you more time to spend outside the trim room. Another set of scissors with a resin-resistant, protective coating. 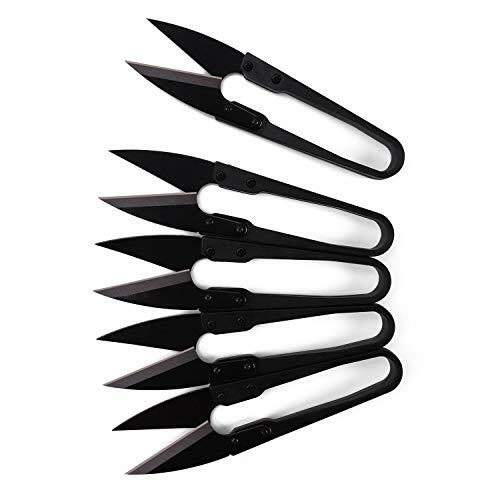 If you find yourself continually cleaning your bud scissors, a set like these with Teflon coating will make the task much less frequent, and therefore less annoying. This pack of trimming scissors is also rust resistant, a common issue for bud trimming scissors. In part, this is because they require less frequent cleaning, but they are also made from Teflon coated blades which are corrosion resistant. The blades themselves are sharp, curved and pointed, everything you need to work deep into the sticky core of a big brand of cannabis and carve it down to perfectly shaped bit sized buds. And with two, even if you misplace the first pair, you can keep trimming with the second.